Lets kick off 2011 with a powerhouse! Salamence have long, heavy tails which can catapult enemies that enter its territory yards into the air at an instant. Its extremely rough and sturdy body is quite tough and hard to penetrate, especially its almost metallic, red, blade-like wings. Salamence have long necks which allow them to take in deep breaths to store and charge very intense Dragon and Fire attacks. 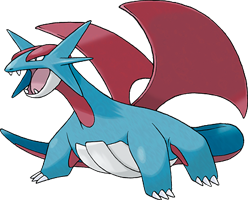 Salamence shares the same species name with Horsea, Dratini, and their evolutions. They are all known as Dragon Pokémon. Salamence is, along with Shelgon, the only Dragon-type that can learn Rollout.